The Nautical Almanac is one of the longest-running publications in the Federal Government, dating back to 1852. It’s also one of the most distinctive-looking books I’ve ever seen. The covers are orange and made of a stiff board-like material, and the cover graphics certainly look like they date back to 1852. Between those covers lie the complex mathematical tables that, “along with the chronometer, the sextant, a steady hand and a keen eye, are the resources needed to navigate by the stars.” Honestly, the contents mean less than nothing to a non-math person, but what images they conjure up for a history person! Old salts striding across a ship’s deck, sextant in hand, getting ready to round the Horn – well, you get the idea. 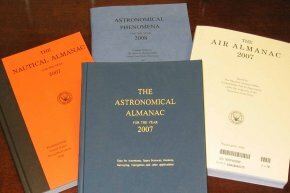 The Almanac is a unique example of a Government publication produced by two countries – the United States Naval Observatory (USNO) and Her Majesty’s Nautical Almanac Office (HNMAO). Also unique is that the U.S. part of the Almanac is in the public domain, but the British part is under Crown Copyright. The Nautical Almanac is one of a number of almanacs published by the U.S. Naval Observatory: the Astronomical Almanac, the Air Almanac, and Astronomical Phenomena. Together, they provide a corpus of navigational knowledge that spans the centuries but is still the ultimate backup to the GPS technology of today. I wonder if they’ll ever change those orange covers? This entry was posted on Friday, May 14th, 2010 at 10:14 am and is filed under Naval Observatory, U.S. Navy. You can follow any responses to this entry through the RSS 2.0 feed. You can leave a response, or trackback from your own site. This is a really inspiring article. I really am very impressed when reading your posts. You post useful stuff. Keep it up. Keep blogging. Really looking forward to opening your next post. Very great post. I just stumbled upon your blog and wished to say that I have truly enjoyed browsing your weblog posts. If people would like to “try before they buy”, visit one of the 820 libraries around the country that hold this item. See http://alaskastatelibrary.worldcat.org/title/nautical-almanac-for-the-year/oclc/1286390 for a list of holding libraries. Happy to learn that these sort of basic knowledge is still existing in form of books: who knows how long satellites shall be working…By th way, thanks for all the interesting talk inputs: very pleasant. Tired of seeing a child becoming hooked upon narcotics to only see them only sleep it off in the dog house…? Wow, thanks for the instant reaction! Just click on any of the titles and it will take you to a page on GPO’s online bookstore where you can order the book. Note: These books are all basically tables of numbers, so they’re not really something for kids. A teenager with some math backgound might be able to use them. Fantastic find. I would love to buy a copy of the book if possible. What a great gift from a young kid interested in the stars.